Designers working on wetland boardwalks often approach us with similar questions as we kick off the conversation. Their clients may also ask us directly: how can we simplify the permitting process? How can we provide access to a wetland area without harming the wetland itself? 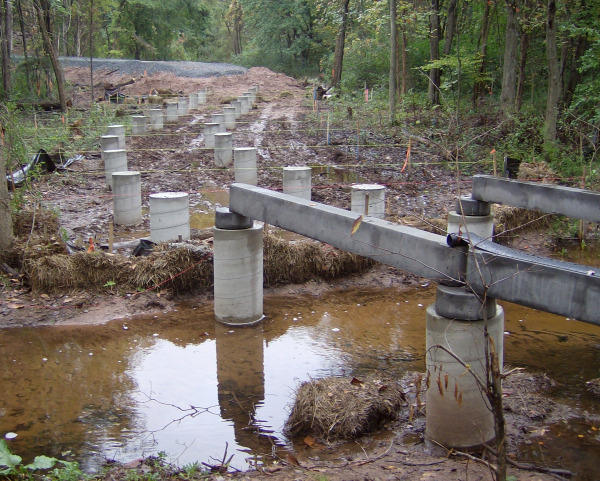 Using the top down method of construction, permitting is usually simplified as it reduces the footprint of the wetland boardwalk during the construction phase. Many wetland boardwalks have been permitted and built with “marsh buggy” machines or cranes placed on large mats in the wetlands. But machinery with large tracks, mats, or even small work barges can be avoided when a designer specifies that top down construction methods shall be used. 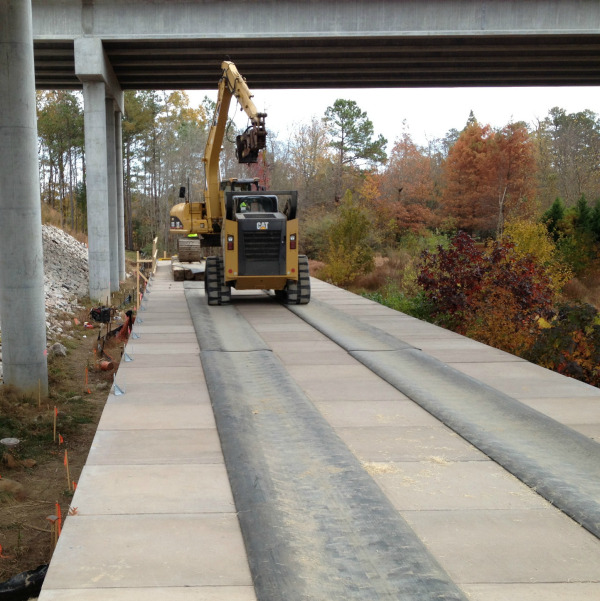 Preferred construction methods can be determined during the concept or project design phase; boardwalk components can then be designed accordingly to support the construction equipment loads during installation. You may ask, “How are foundations installed from above?” Certainly machines are required, where are they to be placed? Installing contractors may already own the proper equipment, and if not, these machines can be rented on a weekly basis. 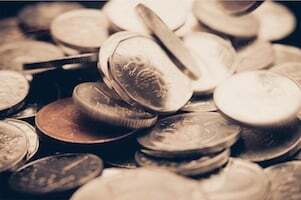 In either case, those machines are readily available to all contractors. These small, efficient machines can work from the top of the boardwalks, if the boardwalks themselves are designed for heavier loads. Attachments are added to the machines for specific tasks, such as handling the foundation components. This is true for steel helical piling or for driven timber piles, both commonly used for wetland boardwalks. 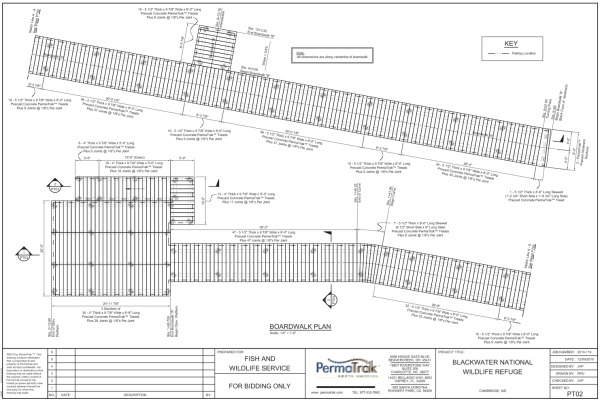 Once the deep foundations are installed, often spaced at 10’ to 15’ apart, then the longitudinal beams (PermaTrak system) or headers and runners (traditional timber system) can be placed. 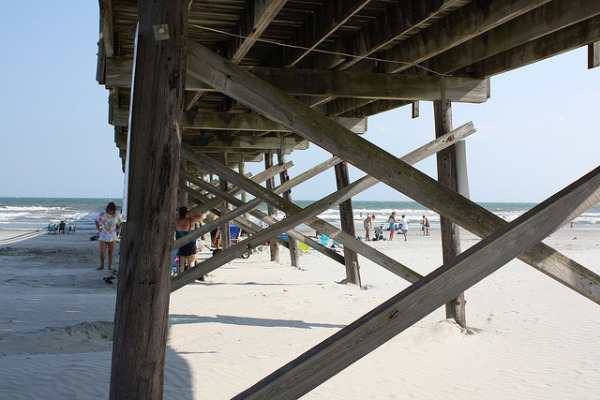 PermaTrak's longitudinal beams are shown on the right, and the timber system detail is shown just below- notice the headers and runners of the beach pier as an example. 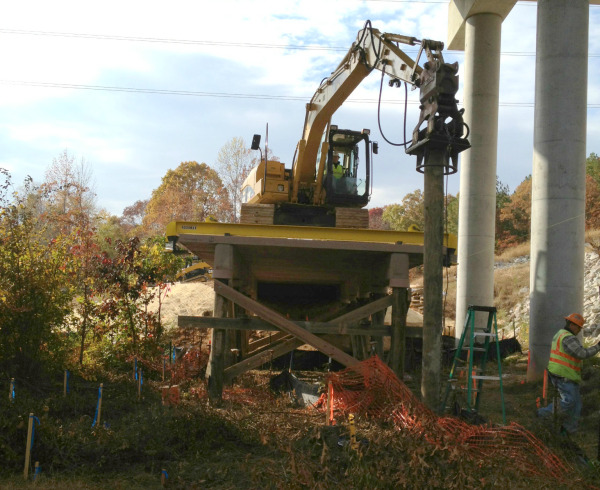 The beams or headers and runners are placed with the same machine that installs the foundation. 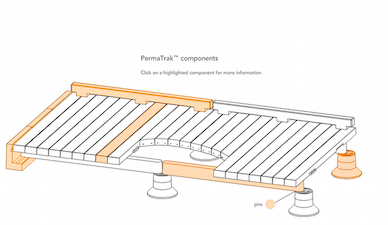 Following these load-bearing elements, the walking surface treads are set with the same piece of equipment (PermaTrak boardwalk) or planks are individually screwed down (timber boardwalk). A steady stream of boardwalk components is brought to the end of the structure as it is built, usually by a skid-steer type of implement. An obvious advantage to top down construction is the fact that the contractor will not spend additional time and money on mitigation efforts. Undue damage to the fragile wetland is avoided. The wetland itself will experience a faster self-healing period, recovering quicker as most of the work was performed from above. In summarizing, the wetland boardwalk design and installation method can be specified so contractors use top down construction techniques. Permitting should be eased in most cases, the construction footprint is reduced and the wetlands will remain healthier. Have a specific questions about top down construction or wetland boardwalk design? Send us a note!